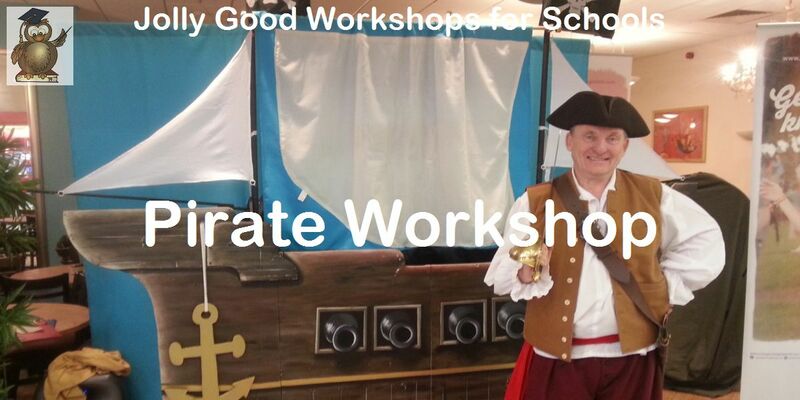 Pirate Workshop Day...exciting, educational and fun pirate experience! 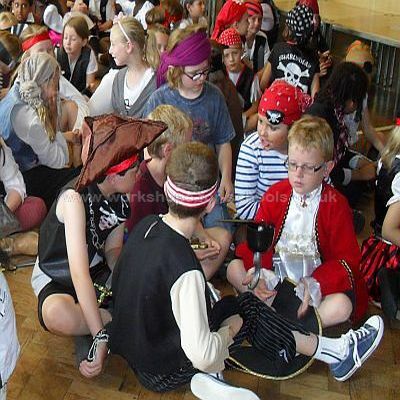 Key Stage 1 Pirate Day. 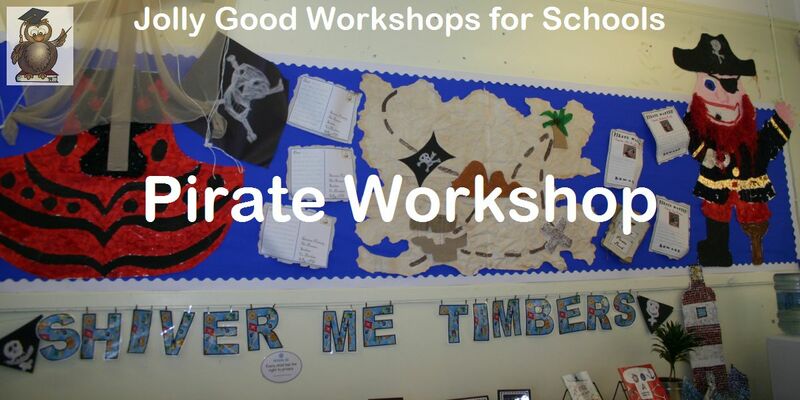 Learn about pirates, watch a pirate show, make pirate puppets all in your own school. 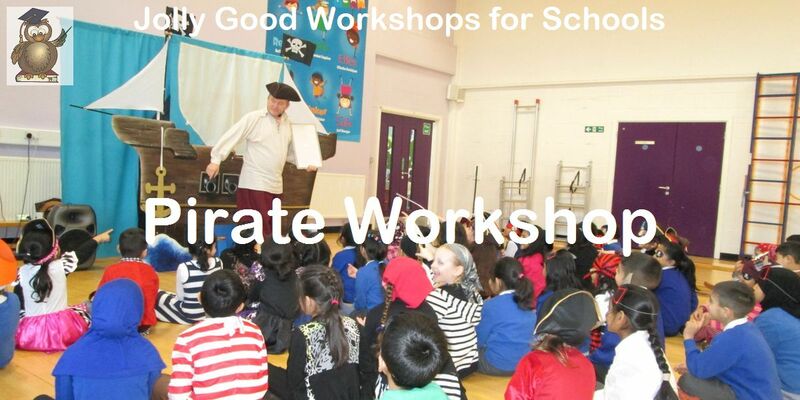 KS1 Pirate Workshop Day is the perfect hook for your Pirate Topic. 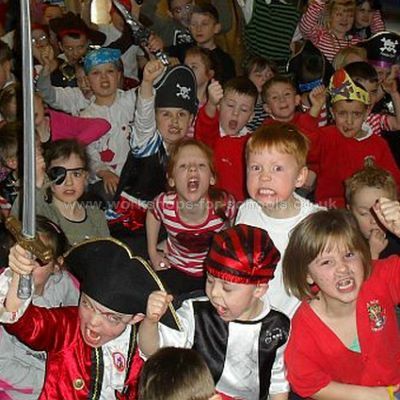 Pirate Day is an exciting and fun educational experience for younger children. 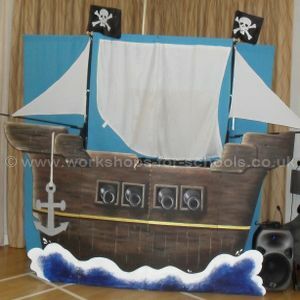 Suitable for Reception, Yr1, Yr2, Yr3 and Yr4 ages groups. Pirate Day is an extremely exciting experience. 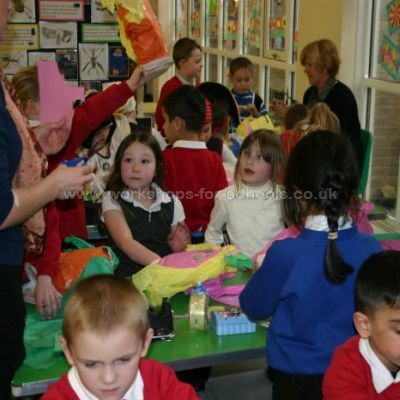 The children are usually joining in enthusiastically right from the start and remain fully engaged for the entire day. 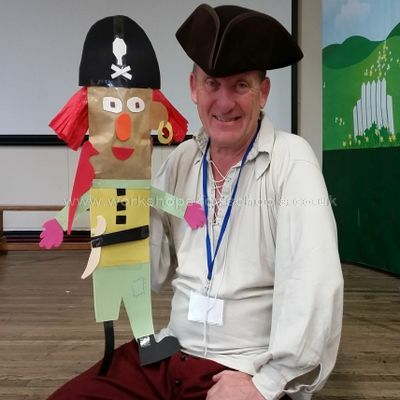 Rascally Ron (aka Pirate Ron ) is very silly and you can be sure the children will soon be be laughing, having fun and joining in. Most importantly though, they are learning too and loving every minute. The children are encouraged to ask questions. Here are some typical examples. Why did pirates steal treasure? Who was the most famous pirate? What was life like on a Pirate ship? Were there any girl pirates? What was the food like on a pirate ship? Where did pirates go to the toilet? Pirate Day is always lots of fun but with lots of learning too! Class photo. 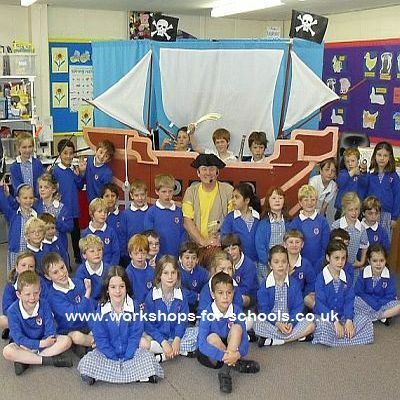 Teachers often like to have a group photo with Pirate Ron in front of the pirate ship. These children were from a well known public school in the Manchester area. 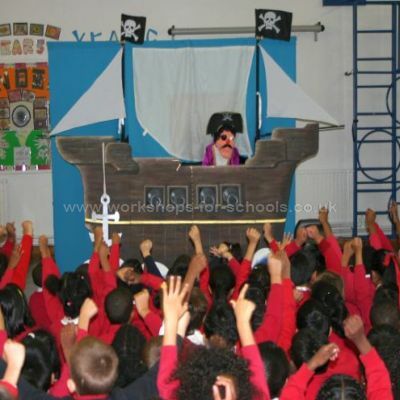 Coming to school in pirate costume is very exciting. Not all schools dress up but Pirate Day is perfect for putting on a costume and usually the teachers come as pirates too. 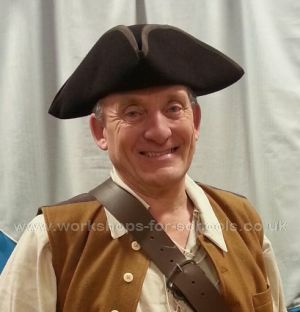 There is usually a little bit of role play in pirate day plus working in pairs to answer questions, to think up questions or to come up with ideas. The puppet making acitivity is accessible to all ability levels and requires minimum suprevision. It allows the children to express their creativity often with amazing results. The pirate puppet show is very exciting. Even children who are normally quiet or withdrawn are usually fully engaged and joining in. Teachers descibe it as more like a mini panto. 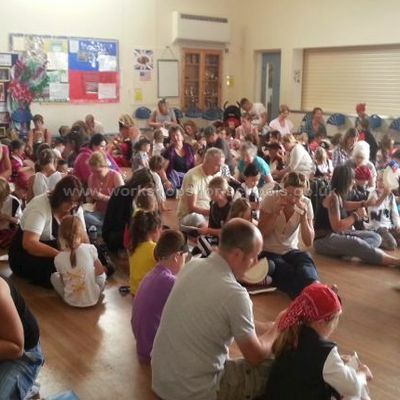 Pirate day is a perfect opportunity to encourage parental involvement. Parent helpers often come in to help with puppet making in the afternoon. 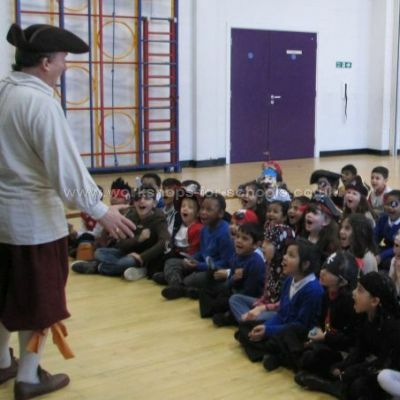 Pirate Ron talking to a group of sixty children. Having two or three or even four classes together for the day is no problem. We do it all the time. Pirate day has so much to offer. The children have a great time from start to finish. They are learning, having fun and they even get their own puppet to keep at the end. Prices vary. Travelling to London and the South is a lot more expensive but we will come providing our costs are covered. When you send in an enquiry we will reply with a quotation and a timetable for the day. We are flexible on timings and will adjust to fit in with your needs. Anywhere in England. We are based in Yorkshire and therefore it costs more the further away you are from us. Not necessarily. We can work in a large classroom. It may mean moving some of the tables and chairs but we do often work in classrooms. Can other classes watch the show? Yes, you can bring other classes that are not doing pirate day in to watch the show. There is no extra charge for this. We bring all materials except newspaper. You will need one sheet between two and classroom scissors, pencils, crayons and rubbish bags. Can we book just the show or just a half day visit? Yes, but the cost will be nearly as much as a full day because of travel. Yes, nursery children can join in and we do sometimes do a full day just with nursery children even if it is just one show in the morning and another in the afternoon for the afternoon children. The cost is the same as for a full day. Please ask for a quote. Year 2 have thoroughly enjoyed this workshop. They learnt many exciting pirate facts! They enjoyed the puppet show and they were able to get involved and be apart of the show. The puppets at the end are a lovely way to finish off the day. The children have been engaged through out the day! The quality of the workshop was excellent. The children (Year 2) were all thoroughly engaged for the whole day. Ron had a charismatic way with the children and they particularly enjoyed the puppet show. The puppet workshop was well thought out and put together. The resources were readily available. Thank you.